Wherein we learn that Christmas traditions around the world are not always what we think they are going to be…because people are not always the same everywhere. That’s why we travel. To learn the differences! You probably take the Christmas traditions of your family and your country pretty much for granted. I know I always did… before I started to travel internationally. Once I spent my first Christmas away from home, I realized that the Santa Claus of the Coca-Cola ads, turkey and ham on the table, and stockings by the fireplace were neither the universal nor the only ways to celebrate the holiday around the world. When I lived in London in 1970, I learned about Father Christmas, stirring the Christmas pudding and Boxing Day. In Amsterdam, I learned about Sinterklaas and Zwaarte Piet and giving gifts to children on December 5th. When I moved to Mexico, the importance of the posadas was a new lesson, and then I learned about Three Kings Day on January 6th. All these new and different Christmas traditions enriched my life. 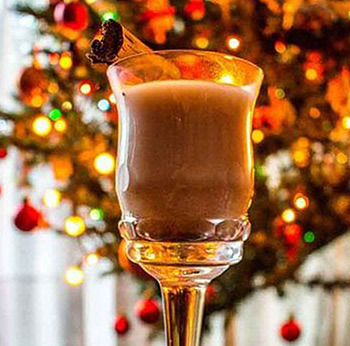 “Cola de Mono” or Monkey’s Tail, is a spicy coffee drink that’s a Christmas tradition in Chile. Photo by Gloria Apara Paillas. The most traditional and very popular Christmas drink in Chile is a smooth and creamy concoction called Cola de Mono, or Monkey’s Tail, and not even the locals seem to know where it got its name. It is made with coffee, milk, sugar, spices and aguardiente. Egg yolks are sometimes added. You can buy it pre-made in supermarkets all over Chile at this time of year, just like you can buy eggnog in U.S. supermarkets, but it’s easy to make from scratch at home. Cola de Mono is often drunk with Pan de Pascua, a special holiday fruitcake. You can find a recipe to make your own Cola de Mono on my friend Gloria’s blog, The Nomadic Chica. Ever since the mid-’70s, fried chicken from KFC has been THE traditional Christmas Eve meal in Japan. The chain’s holiday “Kentucky for Christmas” TV commercials feature pop stars and smiling kids in Santa hats dancing with full boxes and buckets of the holiday treat. The company does so much business on this one day that company execs have to leave their desks to help keep the lines moving in the stores. Many people reserve their buckets of fried chicken months in advance to avoid the waits of up to two hours in line. In Iceland, it’s a wonderful holiday tradition to give gifts of books on Christmas Eve. And then of course you want to get right into them, so you stay up all night reading them. Of all these Christmas traditions, this one might be my favorite! 4 – Girls’ Luck for the Year Ahead? The Czech people have a tradition or superstition related to Christmas: A young unmarried women will throw a shoe over her shoulder on Christmas Day. If it lands with the toe pointing towards the door, she will soon be married. If not, she is destined to remain a spinster for another year…. which I don’t actually see as a piece of bad luck myself! In the Ukraine, the most common decorations for the Christmas tree are spiders and spider webs. This comes from a folk tale about a family too poor to afford any decorations for their tree so they had to go to bed on Christmas Eve with its branches bare. The spiders living in the house felt so bad for them that they worked through the night spinning their webs around the tree. When the children awoke on Christmas morning, the tree was covered with filmy webs, which then turned to gold and silver, assuring the family’s fortunes forever more. These kinds of feel-good Christmas traditions show up all over the world. 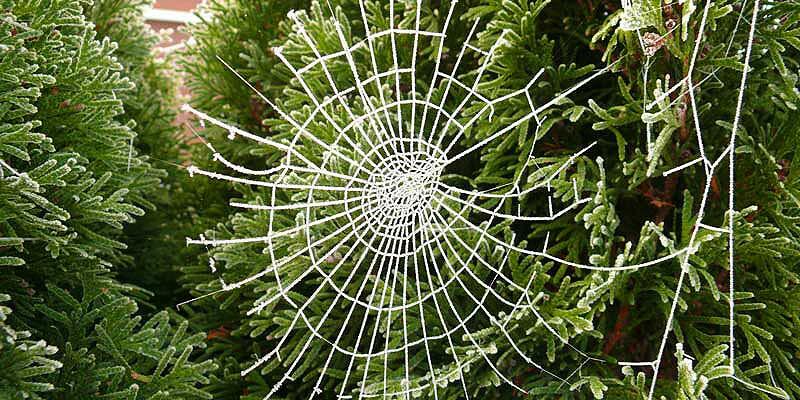 In Ukraine, it is a Christmas tradition to decorate the tree with spiders and spider webs. And speaking of Christmas trees…. In Greenland, Christmas trees have become popular, just like in so much of the rest of the world, but every single one of them has to be imported. No trees will grow this far north! Instead of imported trees, many Greenlanders decorate a driftwood “tree” with heather. And still speaking of Christmas trees…. In the U.S., the largest number of Christmas trees are grown in the state of Oregon. Of those, some 80% come from the Willamette Valley, south of Portland… which is also where most of the state’s best wines come from! 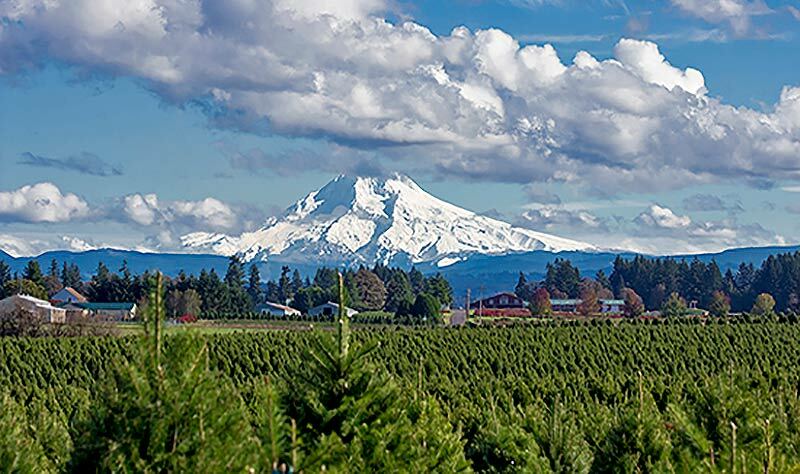 An Oregon Christmas tree farm in Clackamas County with Mt. Hood in the background. In Greece, one of the oldest Christmas traditions is to keep a fire burning in the house for the entire 12 days from Christmas to Epiphany (January 6th). This is meant to keep away the killantzaroi or bad spirits. These little bad guys creep in through the chimney, only at this time of year, to wreak such havoc as making the milk spoil and putting the fires out! In Croatia, it is a very old tradition for young men to give beautifully decorated apples to their girlfriends on Christmas Day. In Ethiopia, the Ethiopian Orthodox Church celebrates Christmas, called Ganna, on January 7th. The people dress all in white, usually in a traditional toga-like garment called a shamma. The people begin arriving early for the Ganna mass, which starts at 4:00 am and can go on for hours. After mass, the men play a hockey-like game, still in their long white shammas. In Caracas, Venezuela, the normally busy streets take on a unique look early on Christmas Day. They are closed off to traffic before 8 am so people can roller skate to early mass! Yep, people don roller blades to glide through the streets to church by the thousands. Sometimes Christmas traditions are downright silly and even a bit gross. In Catalonia, in the northeastern part of Spain, there is an ancient and popular tradition called Caga Tió, which translates as the “Poop Log” (and yes, it means just what you think it does). 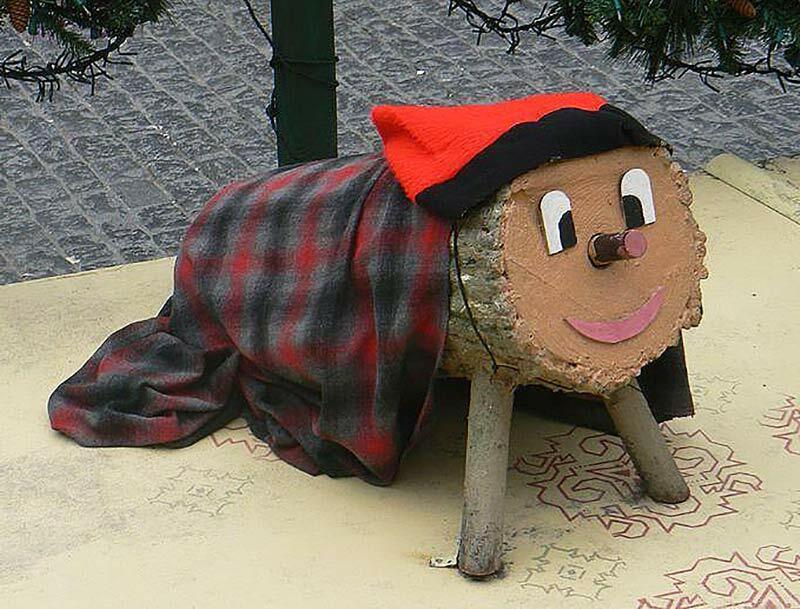 It’s a log, traditionally hollowed out, with a happy face on one end and wearing a bright red Catalan hat. Beginning December 8th, the log is pampered by the children and draped with a blanket to keep it warm. On Christmas Eve, they hit it with a stick while singing a special song instructing it to “poop presents” for them. Then the blanket is removed to reveal presents (stealthily placed by mom and dad) of candy, tourrón nougat and small gifts. Guatemalans want their homes really clean for Christmas. They also want to be very sure the devil is not allowed inside. So one of their main Christmas traditions is to sweep the houses very clean just before Christmas, pile up all the dirt and dust and bring it to a communal pile in the neighborhood. Then they add an ugly devil’s head to the top of the pile and burn that sucker up. Ah, the neighborhood is not only clean but safe for another year! Indonesia is 80% Muslim, but there are still 20 million Christians in the country and the spirit of Christmas has taken hold throughout the land. Santa Claus, called Sinterklaas, is a holdover from the days when the country was a Dutch colony, and all the kids quite expect him to bring them presents on Christmas Day. Oddly, Christmas music is broadcast on most Indonesian TV stations, and the state-owned channel always shows a big Christmas celebration put on by the Indonesian Government. The main Christmas meal in Hungary is eaten on Christmas Eve. It’s a hearty meal of fish and cabbage and also features a special Christmas poppy seed bread/cake called beigli. Another very traditional Hungarian Christmas treat is gingerbread, often wrapped in brightly colored paper and decorated with Christmas scenes and figures. In Estonia, Christmas Eve is the big event, and it begins with a trip to the sauna! It is important to both relax and cleanse oneself for the celebrations ahead. Whole families will often go together. This is one of the Christmas traditions around the world I think I could really get into. After the sauna, you’re ready for Christmas Eve mass… for which the children will usually receive new clothes and shoes. In Australia, Christmas falls in early summer. The only chance for a “White Christmas” is on a white sand beach! And so on Christmas Day, many Sydneysiders do what they do so well… they head to Bondi Beach for the Sunburnt Christmas Festival. About 4000 party-goers will show up for a day of DJs and dancing, surfing, bikini contests and lunch from the barbie. Most people in Brazil will go to a Midnight Mass on Christmas Eve or Missa do Galo (Mass of the Rooster). It’s named for the bird because the rooster announces the coming of day and the mass doesn’t usually finish until 1.00 am. After the Rooster Mass, there are usually big fireworks displays in the larger towns and cities. Since it is summertime, and usually quite hot on Christmas Day, the best of all Christmas traditions often means a trip to the beach! In Italy, the big day for presents is Epiphany (January 6th) and it’s a witch who brings them! La Befana, complete with hooked nose and long black shawl, rides around on a broom. On the eve of Epiphany, she slides down chimneys to leave candies and gifts in the stockings of good children and lumps of coal for the naughty ones. She will also often use her means of transportation to sweep the floor while she’s at it! In the city of Oaxaca, in southern Mexico, December 23rd is known as the Night of the Radishes. For more than 100 years, the city has held this huge festival and competition, where artisans carve scenes and tableaux from giant radishes! The tradition started in 1897 as a way to attract customers to the city’s Christmas Market, held in the zócalo, the town’s main square. Now, the one-day event draws over 100 contestants and thousands of visitors every year and is one of the most popular Christmas traditions in Mexico. Night of the Radishes in Oaxaca, Mexico. Photo by Alejandro Linares Garcia, CC license. Christmas Eve dinner in Portugal is the night to invite the whole family—including those who have passed on. Yes, inviting the ghosts of loved ones lost is a tradition there. Extra places are set at the table for these missing loved ones and some crumbs from dinner are also spread across the hearth to honor them. A traditional part of the Christmas feast in South Africa is deep-fried caterpillars of the Emperor Moth. Since this is the season for harvesting the bug, which is preserved to eat throughout the winter, there is an abundant fresh supply at Christmas time. The caterpillars have three times as much protein, by weight, as beef! Munching on them is a beloved Christmas tradition. Well…to each his own, I guess. Although you may have grown up leaving milk and cookies out as a treat for Santa—and perhaps as a bribe so he will leave you lots of goodies, even if you’ve been naughty—in Ireland, the traditional Santa snack is mince pies and Guinness Ale. I’d say that was a pretty fine bribe! 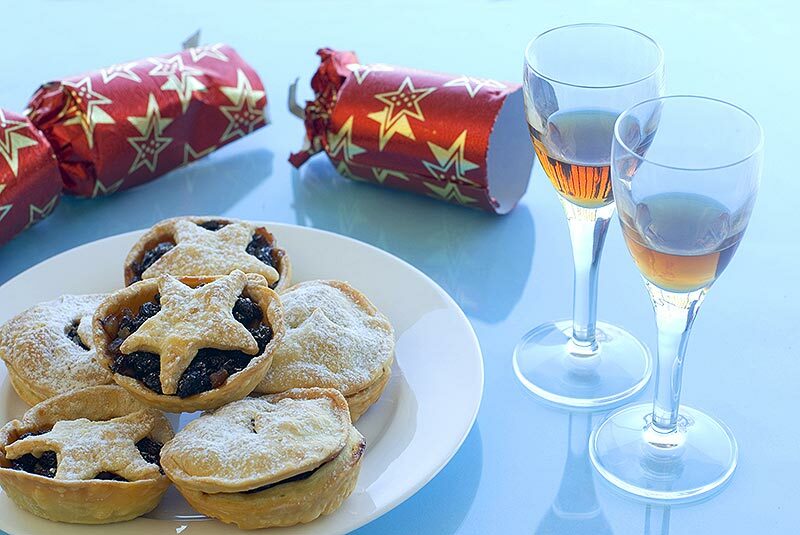 In Ireland, Christmas traditions include mince pies. They are left for Santa with a bottle of Guinness. The tradition of hanging mistletoe in the house figures in many Christmas traditions around the world. It also goes back many centuries, at least to the time of the Druids and the ancient Greeks. It has always been considered a sacred plant and was often believed to ward off evil spirits and bring good luck. It has also been associated with fertility, since it remains green all year long. Kissing under the mistletoe may have come from the old Norse belief that it is a symbol of Peace and enemies can safely lay down their arms if they meet beneath it. Today, many countries maintain the custom of kissing beneath the mistletoe for luck and romance. I hoped you’ve learned a couple of new things about Christmas Traditions Around the World. Have you got other Christmas traditions and stories to share? I’d love to hear them, especially things you’ve learned on your travels throughout the world. Leave them in the comments below and we can all learn more about how the world celebrates this magical holiday. The more we know about each other, the more we understand… and the more we are able to share, to care, to love. And then perhaps the world will know peace. This post should be an annual “keeper”! Thanks Irene. I was thinking as I wrote it that I could not only republish it every year, but add to it. Just think how long it will be in a few years!! THAT was a wonderful post. It’s not what I expected and it was so interesting. I had heard about the Japan and KFC tradition and loved reading about the pooping logs in Catalonia. What a riot! I found each story (ie. Ukraine’s spiders) really eye-opening. Guess it’s because I love to learn. Thanks Janice. It was such fun to write too! I also loved learning about the pooping log! Who knew? Loved learning about these. We are familiar with a couple, but most are new to us. We could add The Feast of Seven Fishes, which is a Christmas eve tradition for many Italian Americans, and making tamales is popular for some Mexican families. The GypsyNesters recently posted…The Piglet Gets Married – A Perfect Day! Thanks guys! I was thinking as I wrote it that I should add to it every year. Maybe next year, I’ll add the seven fishes and the tamales! BTW – I loved reading about “The Piglet’s” wedding! Thanks for this post, Donna. I found it interesting with many traditions new to me. I appreciate your writing and photos. Thanks Sandra. Happy New Year! It was fascinating to read this post about so many different Christmas traditions! I knew it was celebrated differently in different countries, but I didn’t know it was such a wide range of traditions! Thank you! Thanks Rachel. There are so many of these traditions I could do a similar post next year (and the year after) without repeats. I didn’t even explain Holland and Sinterklaas & Zwaarte Piet! Next time. Traditions are important, fun, and fascinating. I lived in South Africa for years, but caterpillars never crossed our plates. At my grandmother’s home in Scotland, though, Christmas focussed on the Christmas Story and the trek to Bethlehem. Hogmanay, and New Year…well, that was quite a different story. Thanks Ursula. Maybe I will do another similar post next year. There are certainly enough traditions! Then I can include Hogmanay! I’ve got to go through this again and bookmark it. So many traditions that are completely new to me. My husband and I love learning about and experiencing new Christmas traditions and you’ve given me a lot to put on our must-do list. I was totally surprised by the “poop log” when I visited Catalonia — still not sure how much I like this one, but the differences in our Christmas traditions make it all so wonderful. I agree Cathy. Not sure myself how I feel about the Poop Log, but I suppose if I had grown up with it, I wouldn’t think it odd at all. I really want to go see the Radish Festival! And drink that Chilean Cola de Mono! Happy New Year! Such a fun list! 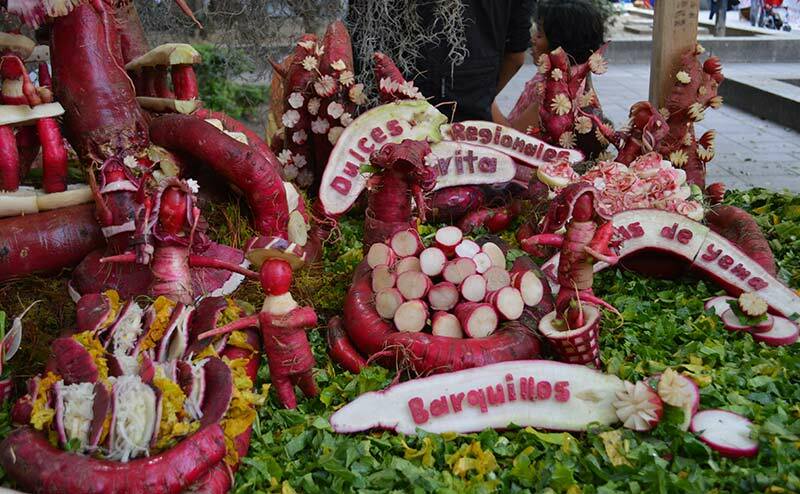 We were just discussing the Caga Tio (funny), but I’d also love to see the radish festival in Oaxaca. Santa always places fresh oranges in our stockings here in Minnesota. I have not yet been to the Radish Festival either, Kris, but it is on my list. As for Minnesota, I imagine a sweet, fresh orange in the midst of a normal Minnesota December could be quite a summery treat! This is a great article. I did not know any of these took place. I think the poop log is my favourite. However would love to see the radish festival and the the sound of a suana on Christmas Eve sounds brilliant. A way of relaxing before all the crazyness. So many amazing traditions. Thanks, glad you liked it. I think the poop log is my favorite too! Thanks Julie. I couldn’t agree more about the Icelandic reading tradition. Or about Japan and KFC!! But the poop log… still my fave! Fascinating look at different Christmas traditions. The Icelandic giving and reading of books on Christmas Eve is my favourite. My husband’s heritage is part Icelandic. I think we should adopt this tradition. I agree Donna. I think the Icelandic reading tradition is also my favorite. Well…. except for the poop log! I just love these Chrisms traditions from across the globe. I had heard about Caga Tió before, but had no idea that KFC was a huge thing in Japan. How strange. Agreed! That KFC thing is really strange! Thanks for the comment! Thanks for the comment, Lisa. I also love the La Befana tradition. Re: Venice… unfortunately February is not possible. I am going to the Copper Canyon then! But we will meet up again soon somewhere in the world! My favourite Christmas tradition is Iceland’s of giving books as gifts on Christmas eve. What a wonderful way to celebrate! I so agree, Bola. Books are always the best gifts and I love the tradition of reading them on Christmas Eve. You had me at poop log! As far as my country goes, Malaysia doesn’t have any unique traditions during Christmas but in the spirit of consumerism, shopping malls around the capital Kuala Lumpur do put up grand and elaborate ornaments like a four-storey Christmas tree and fake snow machine. Well, that may not be unique as far as Christmas decorations in malls go, but in a predominantly Muslim country, I think it would be pretty cool, Daniel. As a curious fact, in Peru families place Christmas nativity scenes from various parts of the country. For example, the donkey and ox are replaced by a guinea pig and llama, and San Jose and the Virgin Mary are represented as indigenous. Same with the baby Jesus. There are usually scenes from the mountains, coast and jungle of Peru, it’s a beautiful tradition. Cheers from Lima! Gracias Esteban! I love knowing that. I’d love to see a creche with llamas and guinea pigs. Thanks for sharing this. Couple of new ones in here for me. Radishes and spider webs. Wow, loved learning about these Christmas traditions. Thanks sue. I had a lot of fun finding them all. And one day I WILL go to Oaxaca for the radish festival! I love reading about various Christmas traditions around the world. (You must have had fun researching this one.) Have a merry! Thanks Donna. Yes, it was fun, especially contacting friends from around the world for their input. Merry Christmas! Strolling Avenida Amsterdam in Condesa, Mexico City Are These the Best Chocolate Truffles in Oregon? In the Country?